Another carbon capture and storage project has been scrapped in Alberta, raising questions about the province's ability to reduce its greenhouse gas emissions. Only two of four government-funded carbon capture projects remain on track in the province following Swan Hills Synfuels announcement this week that it’s shelving its plan due to low natural gas prices. "There's no question that the Alberta government of, say, five years ago was really over-focused on CO2 capture and storage and seemed to see it as some kind of magic bullet," said climate change scientist David Keith. Swan Hills Synfuels: A $285-million funding agreement would have seen underground coal converted to gas and then burned to generate electricity. The carbon dioxide would have been stripped out and sold to nearby oilfields to boost production. TransAlta: The company backed out of a $1.4-billion carbon capture deal last spring. CEO Dawn Farrell said the costs of injecting CO2 into old oil wells to enhance production was no longer competitive with other methods of doing the same thing. But Premier Alison Redford says her government still believes in carbon capture and storage, despite the cancellations. "We still have $1.3 billion invested in other projects and we are still very supportive of those projects. So it is not a policy change, but we are not going to continue to push things if the private sector is telling us they don't make sense." The province's carbon capture target for the four projects was five million tonnes annually by 2016. Now the target is about 2.6 million tonnes through two remaining projects: the Alberta Carbon Trunk Line and Shell Quest. Bob Savage, director of Alberta Environment's climate change secretariat, said the province’s new target is the equivalent of taking more than half a million cars off the road. "Carbon capture and storage remains a key part of Alberta's commitment to reduce greenhouse gas emissions and is a technology that has a lot of potential. The challenge is figuring out a way to do it in a cost-effective manner," said Savage. Matt Horne, a director with environmental group the Pembina Institute, said one reason carbon capture and storage projects aren't making sense financially is because Alberta does not have a tax on carbon emissions. "There is very little incentive here in Alberta to reduce those emissions. If Alberta's policy becomes stronger, there is going to be a stronger incentive to reduce those emissions and invest in technologies like carbon capture and storage." 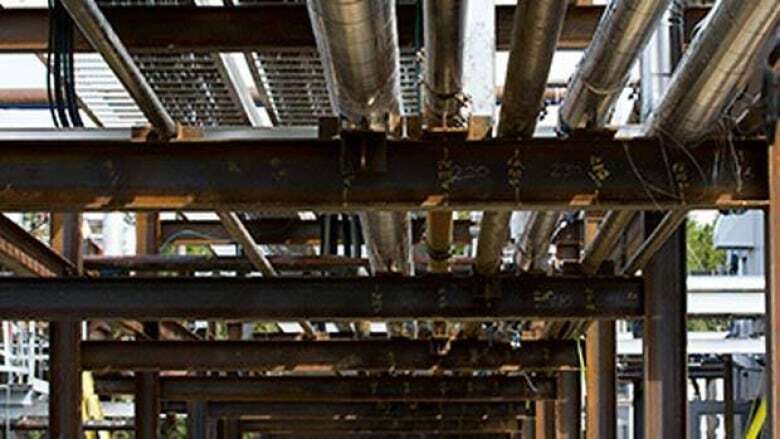 Enhance Energy: A $600-million plan to transport CO2 from refineries in Redwater, Alta., to aging oilfields near Clive through the Alberta carbon trunk pipeline is expected to begin later this year. Royal Dutch Shell: Plans to capture one million tonnes of CO2 annually from its Scotford oilsands upgrader northeast of Edmonton. The gas is to be injected deep into a porous rock formation about 80 kilometres away to prevent it from entering the atmosphere and contributing to climate change. The Alberta and federal governments are kicking in a collective $865 million toward that project, which is expected to start in 2015. Climate change scientist Keith argues that the Alberta government doesn’t seem keen on spending serious money on cutting emissions. "The government really seems to be kind of ignoring serious sustained action on cutting carbon emissions. And that’s clearly a political response to the fact that the political pressure isn’t as high as it was. But I think Alberta needs to take the long view," he said. "The government should be involved by putting a price on people using the atmosphere as a free waste dump and getting serious about cutting carbon emissions." Carbon capture technology is aimed at reducing carbon dioxide, a major contributor to greenhouse gases. The carbon is taken from an industrial source, such as a smokestack, liquefied and shipped by pipe to another location and stored deep underground in porous rock. Proponents say it's the best way to feed the consumer appetite for fossil fuels while reducing the pollution. Opponents say the technology is expensive and unproven, and it's not being done on a large scale anywhere in the world. They also voice health concerns, noting if the concentrated CO2 leaks, it could poison underground water sources or asphyxiate people if released to the surface. How easy is it to nab greenhouse gases at the smokestack?